The MMC EC team raising a restored cross at Kabeljous close to Jeffreys Bay in November. The cross was flattened in a storm last October. 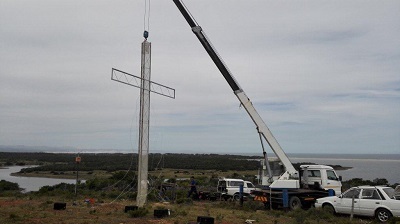 Another cross has been erected on high ground at the MMC venue at nearby Mooi Uitsig farm..
Everybody is invited to a prayer, worship and healing evening at the Newton Hall in Jeffreys Bay on Friday March 1 — the week before the Mighty Men Conference EC — say the MMC committee. “Everyone is welcome. Rich and poor, old and young, healthy and sick, believers and non-believers. It will also be a good opportunity for you to bring someone you know who is going through a tough time….,” say the hosts. Eugene Genis, committee member of the Mighty Men Conference explains: “This will be a good opportunity to seek the Lord and all the good things He has in store for your life, your family and your business. “We are going to call on the name of the Lord and trust Him for His miracle-working power. “So when you create an atmosphere of worship, with everyone praising the name of Jesus, then Almighty God shows up…..and miracles begin to happen. So that’s what we are gonna do. We have a big, bold, happy worship team and we are going to raise a big, bold happy shout of praise to a wonderful God whose name is Jesus. “On that Friday night, together we are gonna roll out the red carpet and welcome the Holy Spirit into the Newton Hall. The Amplified Bible describes the Holy Spirit as the Comforter, Counsellor, Advocate, Healer and most of all…. a wonderful friend. “That’s just what we all need. Right? A comforter, a counsellor, an advocate, a healer and a wonderful friend. Many is the time that we know someone who doesn’t know the Lord so well and who is afraid to come to any church because they say: ‘I’m just not good enough.’ So, that’s why the leaders of the Mighty Men Conference have set up this golden opportunity for you to encourage that special person by bringing him or her to the Newton Hall in Jeffreys Bay. 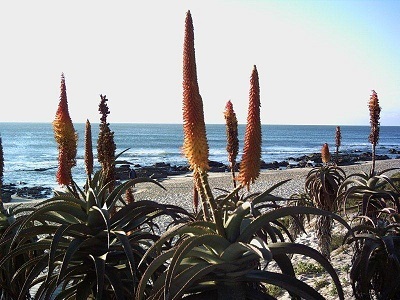 Aloes add colour to this Jeffreys Bay seascape.